Henry Cavill, Ben Affleck, Amy Adams and Jesse Eisenberg star in the superhero match-up Batman v Superman: Dawn of Justice. 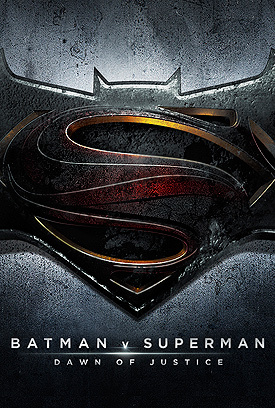 Watch the Batman v Superman movie trailer below! The story brings together two of DC’s most recognizable superheroes of all time together in a live-action film for the first time. MPAA Rating: PG-13 for intense sequences of violence and action throughout, and some sensuality. In “Batman v Superman: Dawn of Justice,” fearing the actions of a god-like superhero left unchecked, Gotham City’s own formidable, forceful vigilante takes on Metropolis’s most revered, modern-day savior, while the world wrestles with what sort of hero it really needs. And with Batman (Ben Affleck) and Superman (Henry Cavill) at war with one another, a new threat quickly arises, putting mankind in greater danger than it’s ever known before. In the Batman v Superman movie trailer, the Dark Knight and Man of Steel face off against the villain Doomsday!